You possible remember that Clean Monday is synonymous to a sea-food feast. A lot of octopus, boiled or grilled, served with olive oil and vinegar, a lot of calamari, our favourite is fried; pulses and pickles are on the spotlight too. Given the miserable weather, I think the menu of the day will incorporate a heart-warming bean soup – fasolada – along with some delinquent sides of shrimps and calamari and of course taramasalata. After experimenting with 3 different types of taramasalata, I played around with cod roe a bit more and what came out was a lovely dressing for salad. 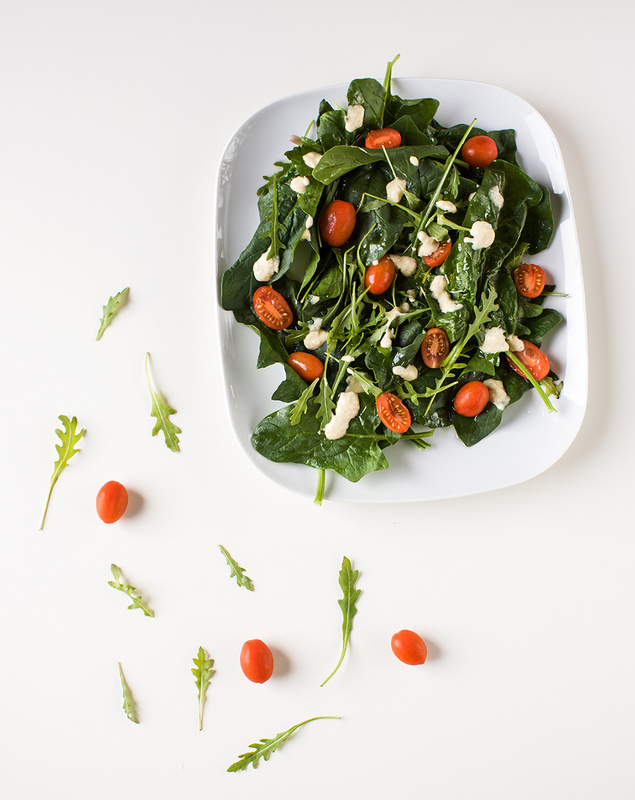 Crunchy spinach, peppery rocket leaves, succulent cherry tomatoes all topped off with a rich cod roe dressing. Use a food processor to mix the cod roe and onion, for approximately a minute. Start adding the olive oil, bit by bit until you get a smooth and runny mixture. Add some fresh pepper and then the lemon juice, slowly and taste your dip to adjust it to your preferences. In a large box mix the spinach and rocket leaves and pour over the cod roe dressing. I’m glad you like taramasalata! this makes a nice change from the standard dip, hope you enjoy it! What are rocket leaves? They look like dandelions leaves? You know how everything has different names in different places. Really looks refreshing. I am still waiting for the first hint of Spring. I think I saw buds today. I never considered using taramasalata as a dressing, genius! υπέροχη ιδέα! θα την δοκιμάσω!